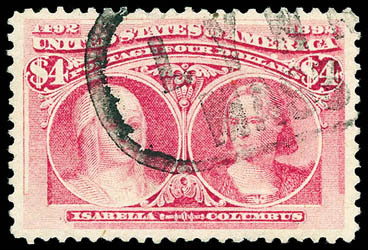 1893, 3¢ Columbian, right margin pair with imprint, o.g., never hinged, exceptional centering within large well balanced margins, intensely rich color and remarkable freshness, Extremely Fine to Superb; with 2003 P.S.E. certificate. 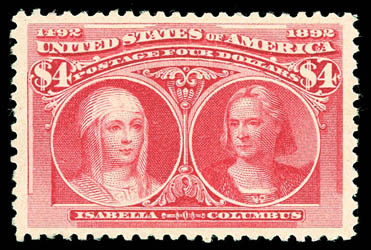 A SUPERB NEVER HINGED POSITION PAIR OF THE 3¢ COLUMBIAN ISSUE. 1893, 3¢ Columbian, bottom margin plate block of 8 with plate "No. 56" and imprint, o.g., never hinged, choice centering with wide margins, rich vibrant color, bright P.O. freshness, Extremely Fine. 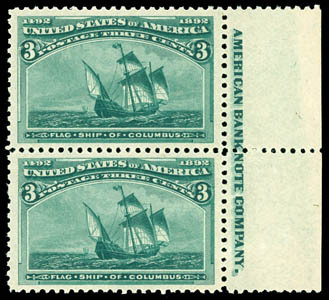 AN EXCEPTIONAL NEVER HINGED 3¢ COLUMBIAN PLATE BLOCK IN PRISTINE CONDITION. 1893, $1 Columbian, o.g., lightly hinged, exceptional centering amid well balanced margins, rich intense color and sharp impression on crisp bright paper, Extremely Fine, a beautiful and choice Columbian high value; with 2015 P.F. 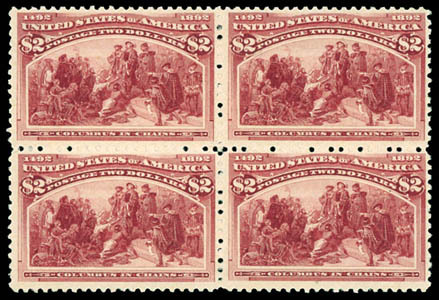 Graded certificate (XF 90, SSV $1,550). 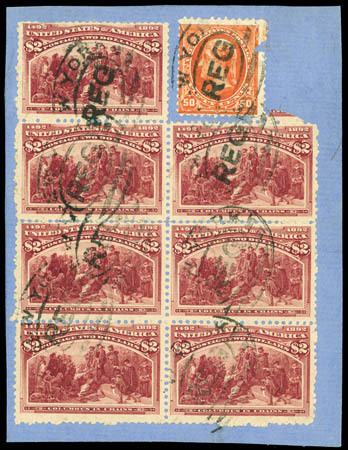 1893, $2 Columbian, block of 4, o.g., lightly hinged, striking rich color and crisp impression, minor natural gum wrinkle on top right stamp, fresh and F.-V.F., an attractive and scarce multiple. 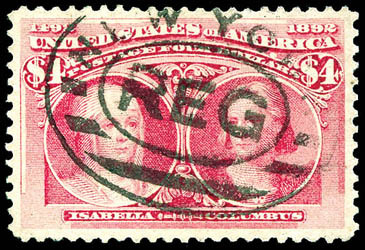 1893, $2 Columbian, block of 7, tied on piece by N.Y. registry oval cancels in combination with 50¢ Small Bureau issue (260 or 275), strong bright color, couple nibbed perfs in top stamp, F.-V.F. Scott No. 242 $7,300 for block and singles. A VERY RARE USED LARGE MULTIPLE OF THE $2 COLUMBIAN ISSUE - ONE OF THE LARGEST MULTIPLES KNOWN. 1893, $4 Columbian, o.g., hinge remnant, precision centering amid wide margins, beautiful rich vibrant color and sharp detailed impression on bright fresh paper, Extremely Fine and choice, a gorgeous mint stamp; with 2015 P.S.E. 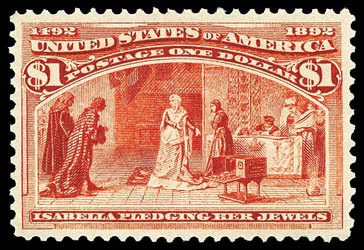 Graded certificate (XF 90, SMQ $4,300). A WONDERFUL "POST OFFICE" FRESH EXAMPLE OF THE $4 COLUMBIAN HIGH VALUE. 1893, $4 Columbian, neat registry oval cancel, precision centering and beautifully balanced margins, bright color, Extremely Fine to Superb; with 1989, 2005 and 2010 P.F. 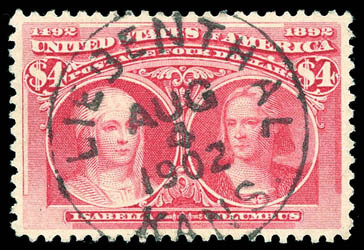 certificates, the latter Graded (XF-S 95, SSV $5,750). THE ONLY USED $4 COLUMBIAN HIGH VALUE TO BE AWARDED THIS LOFTY GRADE WITH NONE HIGHER. ONE OF THE FINEST USED $4 COLUMBIAN ISSUES. 1893, $4 Columbian, oval "Lynn, Mass." cancel, precision centering amid wide margins, bright vivid pastel shade, Extremely Fine, an attractive used Columbian high value; with 2008 and 2015 P.F. certificates, the latter Graded (VF-XF 85, SSV $1,600). 1893, $4 Columbian, socked-on-the-nose Liebenthal, Kans town cancel, beautifully centering amid evenly balanced margins, rich brilliant color, Extremely Fine; with 2015 P.S.E. Graded certificate (VF-XF 85, SMQ $1,425). A BEAUTIFUL USED $4 COLUMBIAN BEARING AN ATTRACTIVE COMPLIMENTARY TOWN CANCELLATION.